This guest post is an extra special one in the Postpartum Depression Guest Post Series because it comes from a mother who isn’t a blogger or writer or maternal mental health advocate. She’s only begun her journey with postpartum depression after a traumatic birth, and yet she felt so compelled to speak out about it and help save others from the same pain she’s been experiencing for the past year. *This is a guest post and all opinions are those of the author and not necessarily those of runningintriangles.com. Due to the nature of the topic, this post may contain graphic details that some may find disturbing. As a women who has struggled / is currently struggling with postpartum depression it is so terrifying for me to share my story and share all of the very raw parts of what makes me who I am. But there is so much importance in sharing our stories with others and coming together and being supportive of those women who are battling with this everyday. 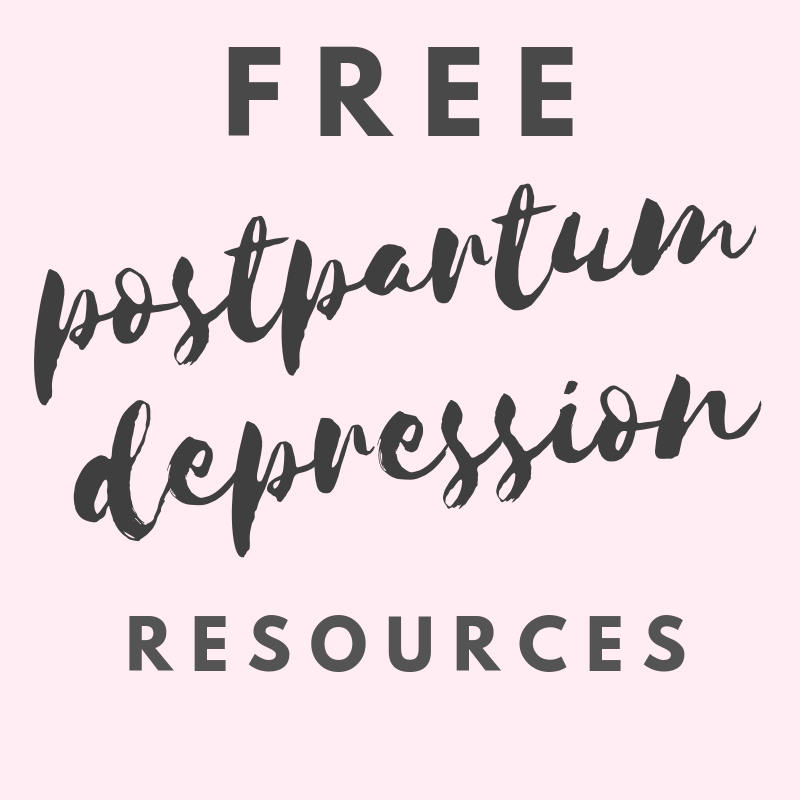 I have battled with postpartum depression for about a year now. When I first started experiencing signs of it I did not want anyone to know, I begged my husband to keep it a secret. It wasn’t until my 6 week postpartum follow-up that I spoke up and got the help that I desperately needed. Before I had my baby, my sister-in-law talked a little bit about postpartum depression and I remember thinking “that will never happen to me.” The sad thing is, this isn’t something we just choose or ask for. It’s not just “in my head.” Or something I can just tell to “go away.” I dreaded the thought of what others may think of me if they knew what I was going through and that dark thoughts that fogged my mind. I felt embarrassed; ashamed; weak. Honestly, words cannot describe it. My postpartum has come and gone in waves. My baby was born on March 8, 2017. The days leading up to her delivery were very overwhelming. I had just flown back home from being out of state for a couple of weeks. When arriving home I got the flu and couldn’t stop puking. I called my doctor the following day because I had some light bleeding and thought maybe my mucus plug had fallen out. When I went in I was pumped with fluids from the dehydration all of the puking had caused. My OBGYN was on call and when she came in to check my baby basically she told me that she could see her head and that I was in threatened preterm labor and I needed to stay to be monitored for the next few hours. That day I went into the hospital I had gone alone, and drove myself there. I didn’t realize how advanced this was going to be. My husband was deployed at the time and luckily I was able to get a hold of him and he was able to book the first flight home. We lived across the country from family and so I had no family near. My mom flew out that next morning. I had gone home the night before and was told I would need to come back in the following day to get my second dose of steroid shots. The first one had been in my leg when I had first gone in the day before. Basically it helps a premature baby’s lungs develop quicker since they may come early. When we arrived back at the hospital they did a swab check and sure enough my water had already broken and I was informed I would not be leaving the hospital until after my baby was born. At that point it was about 11:00 and I was dilated to a 2. Around 2 we were transferred to another room/my delivery room. By about 5:00 pm I was dilated at a 7. I was given some medicine to move along faster. Contractions began quickly and it was the worst pain ever but I was given an epidural shortly after and was told I’d begin pushing around 11:00 pm. My epidural was a life saver: basically the best thing ever. When I began pushing my mom was in the room as well as my husband. They kept telling me to push harder and I literally wanted to pass out. They kept telling me I was getting closer but it still felt like forever. I heard the most beautiful cry and was handed my baby. She was the most precious thing I ever laid eyes on and the tears just rolled down my cheeks. My baby was quickly passed off and I heard “she’s losing a lot of blood.” apparently I bled more than usual but I had a good team taking care of me. My baby was in the special care unit for a week after being born. Every time I had to go home at night I worried about leaving her, I worried she would have an oxygen spell and something bad would happen and she wouldn’t come home. I think that’s where the very start of my anxiety began. It should have been a happy time after my baby was born, and it was, but also I don’t remember a lot because I was in such a dark place. I remember feeling darkness and anxious all the time. I didn’t feel like I knew my own child, I just felt cold and broken. All I did was exist. As our families were traveling out to see our new baby I remember going places and all I could see was right in front of me and everything to the side of me was toxic. I felt like I was suffocating and I just kept telling my husband that I needed to go home. I felt fine but also I didn’t. I didn’t know what was wrong with me other than I felt like i was having some sort of out of body experience. After my baby was born I wasn’t able to produce enough milk to nurse her. I was trying everything and nothing was working. I was the biggest joke and the one thing I was created to do I couldn’t even do and I was so defeated and mad at myself. I felt like it was my fault and I was starving my baby and she would never like me or I would never measure up or be enough for her. It made me really sad and I got a lot of crap from other people. My husband kept telling me not to quit and keep trying but it was exhausting it seemed like all I was doing was pumping and nursing and then nothing was coming out so then I had to end up supplementing anyway. I began hating bonding with my baby, I hated skin to skin because every time I did it I got sad knowing that I wasn’t enough for her. Eventually those emotions began destroying my relationship with my baby and my spouse. I was really angry. And I didn’t want to do anything other than lay in bed, I didn’t feel like I was good for anyone or anything and I told myself I would be better off if I was just dead. My doctor recommended that I stopped nursing and when I did I felt better and I began to finally accept the facts. But the sadness and the anxiety began to effect other parts of my life and I began having multiple panic attacks daily and lots of suicidal thoughts. At that point I knew It was more than just baby blues or more than just “the nursing situation.” It was more aggressive and I needed help because this wasn’t something I could fix on my own. I didn’t have any intentions on telling anyone but when I went to my 6 weeks postpartum follow up I was eager to get the help so I could get rid of the pain I felt. My doctor and husband were the first to know and they were very supportive in getting me help. I began medicine and seeing a therapist but after a while I didn’t feel that the medicine was helping so I stopped taking it and slowly my anxiety and depression began to go away. And I felt that I was cured. It wasn’t until my baby was about 8 months that my postpartum depression came back. It wasn’t super bad but it was there. At this point I wasn’t seeing a therapist anymore and I still hadn’t gone back on my medicine. I got right back into therapy and I thought that was helping. And then my postpartum went away again. So I stopped seeing my therapist. My baby is a year now and my husband is currently deployed. And my anxiety and depression has been pretty bad for about 6 weeks now. I don’t really know if this is more than just postpartum but I have found that it helps to talk about it. Empty, broke, lonely, darkness. I feel like I am not worthy of love. My entire body feels overwhelmed, my heart aches, I feel weak and tired and really really sad and I have a really hard time getting done any of the things I need to get done. I feel like I’m just surviving and hoping that I’ll just make it through the day. Most often this is triggered on gloomy days; when I’m alone or I’ve been in the house for longer than I should be. Jumping out of a moving vehicle, jumping out of the airplane emergency door while I’ve been flying, jumping out of my window, and crashing my car. These were some of my deepest darkest thoughts when I first had my baby. I don’t really have these thoughts anymore but I know that I need to get a good hand on this now so I don’t have these thoughts arise again. Not being able to get things under control, my mind overpowering me. Losing my loved ones: not being enough or measuring up. Failure of being a bad mom or not being enough for my child. Disappointing or letting my baby or my spouse down. I watch as my child gives me kisses and calls me mama and wants to be cuddled and rocked at the end of the day and In her eyes I know that I am a hero, and she needs me and that helps me to keep on going. But my mind convinces me that I’m not worthy of all of that and then I spiral down and I let it get the worst of me. Often I sit here and I feel alone. Lately more days than not and all I want to do is break down. I keep searching for something even though sometimes it feels like I’ll never reach it. I know that I am not the only one experiencing this. I know there are so many other women out there going through the same struggles. Chances are thoughts you have had, I’ve had to. I am here for you. And we can fight this together. We should not be ashamed or hide away because we are embarrassed. Let us all grow and help one another overcome this daily battle. I will continue fighting and I will not let myself be a victim of this.